As art experienced a new style known as Gothic, so too did armour. This German Gothic Sallet Helmet with Bevor is a detailed view of how armour took on the gothic styles of the time, creating visually appealing armour that was also quite protective to wear. As its name implies, this helmet is based heavily upon the German styles, which were among the most influenced by Gothic styling. Gothic armour sought to imitate the pleated clothing trend of the age and, in doing so, not only made it more appealing but also more structurally sound and protective. This helmet features similar examples of limited pleating while also echoing the form of the classic gothic sallet helmet. It is crafted entirely of 14 gauge steel, making it quite thick and hardy. Its overall design involves a heavy helmet adorned with rich brass edges and a rotating visor with a slit to allow the warrior to see out. This helmet also includes a bevor, which is worn around the neck and chin. 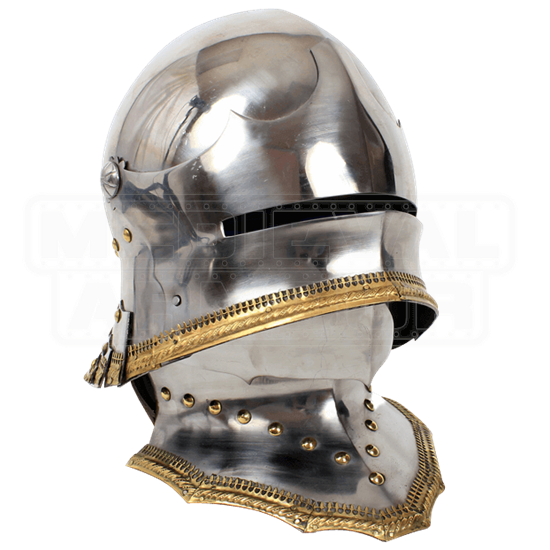 Together with the sallet, this armour piece provides full protection for the head, neck, and chin. The interior of the helmet features adjustable leather lining, and a chin strap provides ease of wearing. 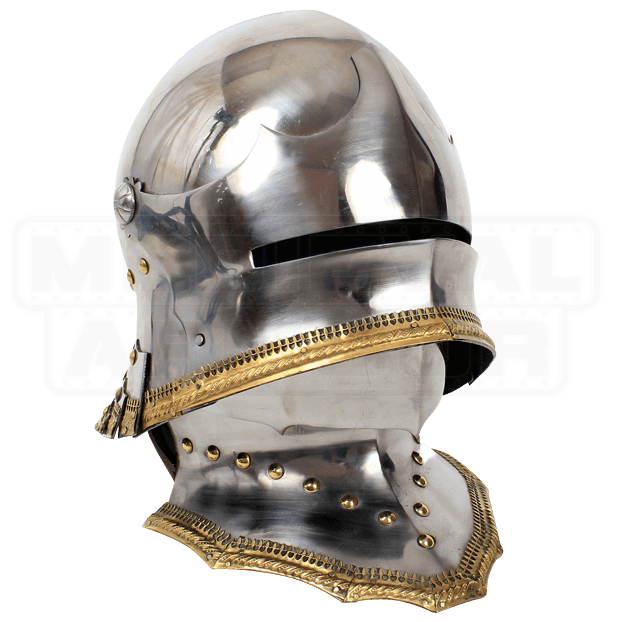 Form and function come together in this German Gothic Sallet Helmet with Bevor, making it a fine helmet for any knight or warrior to wear, whether they are making an appearance at the Ren fair or fighting their foes off in a mock tourney at any combat reenactment event.